Making your own wire woven cabochons means you will be able to have a spectacular focal for the handmade necklace you made. The necklace can be strung, kumihimo, Viking knit, wire crochet, leather, cord, chains, chain maille etc. So if you want to learn how, Dawn Horner's Start Wire Weaving: Cabochon Pendants might be just the class for you. The class is 2.8 hours long and spread over 7 lessons. It is specifically designed for beginners. The in depth class covers everything about wire right to how to antique it and everything in between. The thoroughness as well as all the tips and troubleshooting help newbies learn this technique. The class is versatile as different shapes of cabochons can be used. As with all Craftsy classes, the format is such students can watch the class when and where they want and as many times as necessary to learn a technique. You will be able to ask Dawn any question. Dawn covers wire working basics and how to do the basic 2 by 2 Figure 8 weave. Wire work can be hard on the fingers and even the body - imagine being hunched up for ages concentrating on the design process. So Dawn briefly mentions ergonomics and how to use a special tape to protect fingers. Dawn goes over what sort of shape and size the cabochon should be and the wire gauge to use depending on what you chose. The considerable tension exerted on the wire woven cabochon means softer stones should not be used. Sizing the bezel is an important step and Dawn shows a really easy way to do it. This lesson also shows how to form the wire weaving correctly around the stone. I particularly like the "saw tooth" wire weaving variation - the middle design in the last photo below. Many of Dawn's solutions are simple ones - I like her tip on how to keep her spool from rolling around the table! She is also a fan of the bent nose pliers which she uses in a number of places. The bail design is so crucial to the final look of the piece. So Dawn's version not only is functional and strong but attractive as well. This lesson shows how to shape the main bail wires and to wire weave the cigar shape. I can see why Dawn takes such care at this spot as beginners need to adjust their tension as they go along. She also demonstrates how to introduce a spare wire which sits in the middle of the bail. The extensions is used to form swirls at the back and front. It is both decorative and functional as it ensures the wire weaving is held tight. Dawn mentioned she's seen customers wear her designs backwards. But why not? The back is as attractive as the front! She shows how to wire net the back as well as how to stitch wire swirls at the back. One of my favorite parts of the class was when Dawn shows how to creatively fix a lopsided wire woven piece by adding more wire. The final work looks like it was a deliberate part of the design! The front of the cabochon is more open so that most of the it is visible. Here Dawn shows how to add the final touch with the addition of metal beads. Dawn uses only copper and sterling silver in her designs. The combination is so attractive when it is patinated. This final lesson shows how she uses liver of sulfur gel and how to polish it up. She also includes a demonstration of the use of a tumbler if you'd rather not polish by hand. It's a pity the Craftsy studio uses such a dark grey background for the instructors' pieces as it doesn't do the pieces justice. Dawn's work is lovely - I spent the entire lesson frequently ogling the necklace she wore! This versatile class is highly recommended. 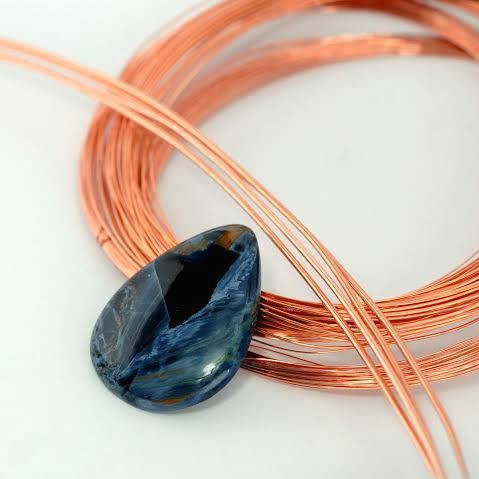 Beginners should practice with copper wire until they sufficiently comfortable with wire weaving cabochons before venturing to precious metals. The winner of the giveaway will win not only win Dawn Horner's Start Wire Weaving: Cabochon Pendants class but will also receive a gorgeous cabochon and all the copper wire needed for the class (shown below). If you want a chance to be that winner, please make a comment below. Make sure you leave contact info below if you do not have an online shop or blog. It ends in a week's time at 6 pm EST Monday, November 30, 2015 . I will pick the winner randomly and announce the results as soon as possible after. So be sure to leave a contact email if you don't have an online link or make sure you come back and check! Otherwise I will redraw in a week. Good luck! I am a Craftsy affiliate which means I receive a small compensation when classes are purchased through my blog. The opinions expressed here are entirely mine and mine alone. These would be the same, whether or not I receive the compensation. I love her designs, the back details really sets them apart. Would love the opportunity to learn how to do this! Sounds like a very informative class, and without feeling as if someone would have to stick to a rigid pattern or technique to feel successful in producing a pendant to be proud of. Count me in. Beautiful pieces! Would love to win and learn! I love working with wire, but my efforts are so amateurish. Sounds like this tutorial is just what I need. Please enter me in the drawing. Thanks so much for this blog. I look forward to it every day. This is want I want to learn for a long time. Hope I can win. Blog subscriber. I have wanted to try wire weaving for a while now. This class would be a perfect way to get started. Wire working can be so tricky, but so beautiful and functional when done right, there's a lot of info out there on doing it, but it is hard to narrow it down to the best and most effective advice-this looks like just the right kind of lessons I think! Plus very generous to include the cab and copper wire too. Blog follower and subscriber, can be contacted at retro-grrl@hotmail.com, fingers and toes crossed! I have done wire wrapping for years but was always shy about weaving. This class looks like just what I need to take that next step. I have fallen in love with wire. I just started making jewlery in February and love how wire can become anything you want. This course would help take my skills to the next level. Lovely wire weaving! I would love to learn this. I've decided to give myself a new craft for Christmas, and learning to wire-work would be ideal, as I already have a ton of wire, and cabs to play with! Can be contacted at dekwalker@gmail.com. Wow, would love to learn to do this as I just started making my own cabs!! This would be a perfect gift for me, I would love to win. Been intimidated to start weaving, this sounds like a great way to learn. Her backs would make me want to wear them facing forward as well - it would definitely be a tough decision!!! This has made my morning coffee taste even more excellent! Chuck my name in there Pearl....I really want to give Lady Luck a spin for the prize! I would love Dawn Horner's Start Wire Weaving: Cabochon Pendants. It looks great and the supplies are also a part of the winnings!! These designs are some of the most interesting I've seen...would like to try them. You have the best give aways! I'd love to win this one. Hope I win...Thanks for the chance. this class sounds like some thing that could really take my skills to the next level. Dawn is an amazing wire worker. Here work is beautiful and something to aspire to. I think this course could be exactly what I am looking for to develop my work so I shall be keeping everything crossed. Seeing some nicely wrapped cabs was one of the things that got me interested in jewelry and wire work. I've yet to try it myself, so I would love to be a part of this giveaway. I am a follower of your blog. I can't believe how many awesome wire working giveaways you've had lately, Pearl! I have a stash of pendants just waiting for my skills to catch up with them! I've been fascinated by wirework for a while, but too intimidated to give it a go! I'd love to win this - and maybe develop a spot of courage!!! Love this, send it this way please. I love those designs. Always love cabochon ! there always elegant. Thank you for the chance to win this giveaway. I'm a blog follower and facebook fan too. This class looks right up my alley! would love to win the video and goodies. I could use some pointers on cab wrapping. I haven't done any jewellery making in a long time but I'd love something like this to help get me back into it! What a terrific class this would be. I have always viewed wire working as a bit intimidating. I am a blog follower. Thanks for the chance to win. I soooo want to learn this! If I don't win I'll have to buy this class. ... I'm a follower. This sounds and looks so great. I'd love to learn how to do this. I just tweeted about this post and giveaway. For a beginner this looks awesome! I so admire this! What a tempting opportunity! I'd love to win such a professionally thorough class, the tips on ergonomics are very important, too! I am a blog follower. I am a huge fan of her work and her class is wonderful! I LOVE craftsy and Dawn's work. I'd love to win her class, before I buy it! Thanks bunches, Pearl, for yet another great giveaway! I would so much enjoy the opportunity to learn this form of (art) Jewelry Making !! Thank you for the chance with this giveaway !! I am in awe of the beautiful bezels that are created from wire and handwork. I have taken some classes on soldering and I have done some of them. But, when it came to trying the wire weaving, I did not do so well at looking at a book, which tells me a Craftsy class is exactly what I need to get the hang of this art. I would love to be picked to win this class and today (Thanksgiving Day, November 26) is my 60th birthday! Yep, I am a turkey for real today! lol. Happy Thanksgiving everyone! This class looks amazing. Would love to win it! Would love to win this to learn how to make these beautiful pendants!! I would love to win this! I have been trying to learn how to do it. Thanks for the giveaway, Pearl. Would love to win this class as the method is on my to do list. This technique is next to learn on my list. I've done traditional wire wrapping, but want to learn this more freestyle approach.